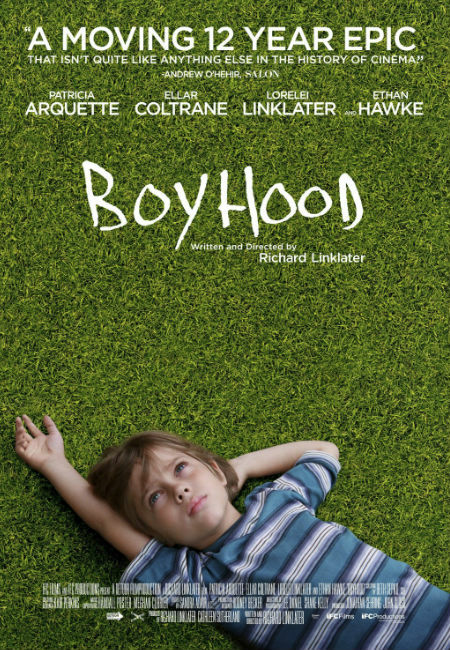 Boyhood is a remarkable movie in many ways. Not the least of which is that director Richard Linklater (who also wrote the screenplay) filmed this intimate portrayal of one boy’s journey from video games and daydreaming into the early stages of manhood and college in real time over twelve years, using the same actors who filmed for a week or so in what Ellar Coltrane, who plays the titular boy of the piece Mason Evans Jr., said was like attending a very unusual annual summer camp. This innovative, patient and risky strategy – who knew if this suite of actors which includes the director’s daughter Lorelei as Mason’s older sister Samantha, Patricia Arquette as his loving mother Olivia, who demonstrates exceptionally poor choice in men, and Ethan Hawke as his often absent but genuinely caring father Mason Evans Sr., who seems to be growing at roughly the same pace as his kids, would be available year after year, or if after over a decade of unorthodox filming that the movie would bear the sort of fruit is backers, both creative and financial, would be expecting? – has brought forth a narratively-based film that feels like a masterfully-edited documentary of one family’s attempts to simply live life as best they knew it at the time. Linklater’s masterstroke, and another quiver in the bow of this impressive movie, is that it eschews grandiose, melodramatic, heart-stopping moments in favour of quiet but meaningful snippets of the real issues any young suburban boy and his family must potentially grapple such as peer pressure, marriage, divorce, domestic abuse, moving, sibling rivalry, the joy of first love and its painful loss, alongside milestone moments like birthdays and graduation. 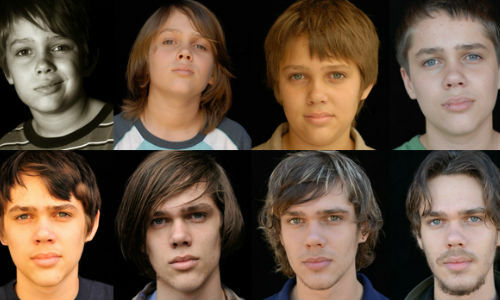 In so doing, Boyhood, immerses you in the ebbs and flows of this family’s life, which takes different forms good and bad over the years, such that you almost begin to feel like you are part of this family and its extraordinarily told tale. As you watch Mason, an unusually thoughtful, introspective young boy, prone to not handing in his completed homework, simply because his teacher didn’t specifically ask him for it, or who put rocks in a pencil sharpener, not to be destructive but simply to see if he could re-produce one of his beloved arrow heads, grow up in a world defined by what his mother self-depracatingly refers to as her “poor life decisions”, Boyhood feels less like fly-on-the-wall cinematic voyeurism and more like an inclusive expansive family movie, where you are a legitimate fellow member, taking in every rise and fall of Mason’s passage to adulthood. It explains why it’s possible to make such a profound emotional connection to these characters; you feel as if you have lived through a small lifetime of events with them, and are connected with them more powerfully than the people in most films. Certainly, one thing that strikes you time and time again is how wonderfully ordinary and universal and thus relatable it all is even as it is mesmerisingly experimental and innovative. There are moments in the films such as when Mason is passively watching his friend out the car window on his way to a new life in Houston, where his fiercely supportive and protective grandmother played by Libby Valleri lives, or riding around town on his bike that hit you like flashes of recognition as if you are witnessing your own life play out before you. It is impossible not to feel like passages of your lie have been lifted up out of their ordinary, unremarkable setting and placed up on the screen for all the world to see. There is a powerful sense on many occasions that this is exactly how it is growing up, sudden recollections of the messy morass of emotions like confusion, happiness, contentment, joy, anxiety and incandescent excitement rising up in the most unexpected ways in scenes that pulsed with blinding familiarity. And that is really the point I guess, to illustrate that our attempts to make sense of life, and make something worthwhile of it, peculiarly American rites of passage aside, with all its imperfections, missteps and both poorly-realised and exquisitely-alive moments, is something common to every single one of us. We may not all move from home to home, town to town as Mason’s mum does in search of a career and a better life for both herself and her kids, or have a sporadically-present father who seems to be making up his parenting skills as he goes along (and thankfully gets much better at fatherhood as he goes along), but we can identify with the fact that nothing feels fixed and certain, and yet, that even with that constant change, some things stay the same and give us comfort and a place to call home. It’s simply life in all its messy, frayed, likely-could’ve-done-better moments and Linklater brings them all to life in gloriously recognisable yet dramatically subtle detail, with various songs unobtrusively inserted to mark the passage of the years, that rekindle the memories of times gone by and all the things good and bad that filled their days. And that is the chief pleasure of Boyhood. It doesn’t seek to represent life as anything more than what it is. Mason, showing a flair for photography, video games and deep and insightful thinking that some people mistakenly perceive as morose or weird, isn’t trying to re-invent the wheel as he goes about the complex business of growing up. Like any of us, struggling to process a plethora of new experiences from changed family dynamics, school bullies, drunken step fathers, turbulent teenage years, first jobs and the tricky act of becoming a grown-up, and react accordingly with no previous life experience to use as a reference, Mason, and indeed his whole dysfunctional but loving family, has to react to what is before them with the limited information available at the time. Just about everything he goes through is rooted in the banal rhythms of the everyday, rather than the sort of big, epic moments that many films bring to the fore to either keep us interested or conjure up a false emotional investment that might not otherwise be there, and it gives the film an enjoyably ordinary feel to it that is even so, never less than endlessly captivating. Boyhood, one of the best films of the year so far, is a nuanced, emotionally-layered film that reminds us in almost every scene that the great moments of life, its triumphs and failures, its highs and lows, are to be found in the cluttered, undramatic minutiae of existence and that we should treasure them because, flawed or not, we won’t get a chance to re-live them in quite the same way every again.